Alan is mostly right, but partly wrong. To refresh us all, the letters SWOT are an acronym formed from four quadrants of an internal and external audit of an organization’s operational environment. Both the positive and negative aspects of each are explored, and the organization’s Strengths, Weaknesses, Opportunities, and Threats are identified, as illustrated in the diagram below. The first argument that could be leveled at the SWOT Analysis is that it’s incomplete. And that argument is absolutely correct. 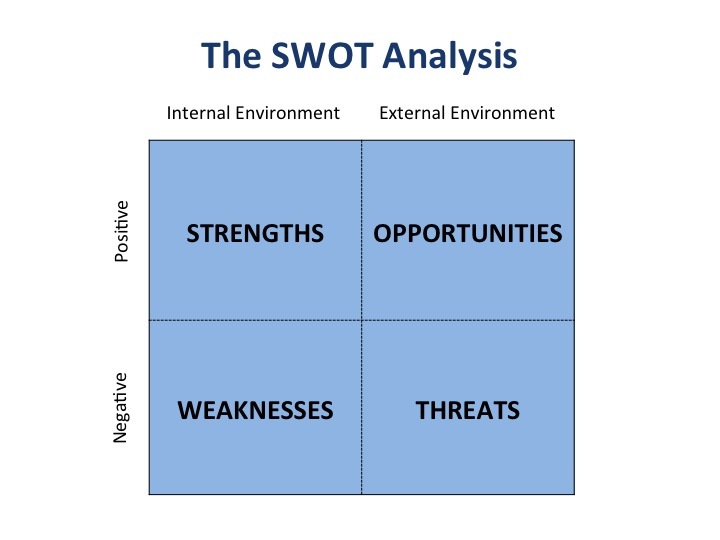 The main reason why SWOT is incomplete is that it doesn’t include analysis of the customer environment. It’s focused internally, on your company, or externally, on your competition. Therefore it should never stand alone in strategy formation, for any strategy that leaves out looking at the needs, desires, motivations, and habits of your customer is really no strategy at all. A second failing of the SWOT Analysis is that it’s merely theoretical, data only without a path forward to action. And, again, this argument is true. I’ve sat through SWOT sessions where, at the end of the discussion, everyone stared proudly at walls covered in flip chart pages, thinking they had just finished a strategic plan. All too often we are content with engaging in theoretical exercises because the real work of change is hard. Data gained from a SWOT Analysis is just that, data. As such it must be acted on for it to have any usefulness. And, ironically, the more data you have, the more resistance there will be to change. Analysis paralysis is what this is called, and it’s a real issue; not because the two words rhyme, but because information considered outside of the context of execution is fatally flawed at its core. In spite of these limitations, however, a SWOT Analysis can be helpful as part of a strategy formation process when used properly. And its proper use is considering the elements in this order: SOTW, or what I call The SOTW Path. Companies, like people, have things they do very well and things they love to do: passions and proficiencies. These are our strengths, and instead of being “well-rounded” companies or individuals, we should be well-leveraged. That is, investing heavily in utilizing our strengths in at least 80%, if not 90%, of what we do. This is the only way to achieve excellence in the competitive markets in which we live and work. Another way of saying this is identifying your company’s core competence, the handful of things you can do at world class levels, and maximizing the full use of them. Where do you do that? In Opportunities. That is, moving from the S quadrant to the O quadrant. Our best work should be invested in our best opportunities for our business to grow to the greatest degree. Or as the authors of Blue Ocean Strategy assert, exponential business growth occurs in uncontested market space where competition is the least. What happens, then, when we do our very best work in the very best areas of opportunity is that this leveraging of our our strengths makes threats to our business irrelevant. They become overwhelmed by the expanding opportunity, or at least minimized to a manageable degree. What’s the point in considering threats at all? By understanding how they relate to your weaknesses. 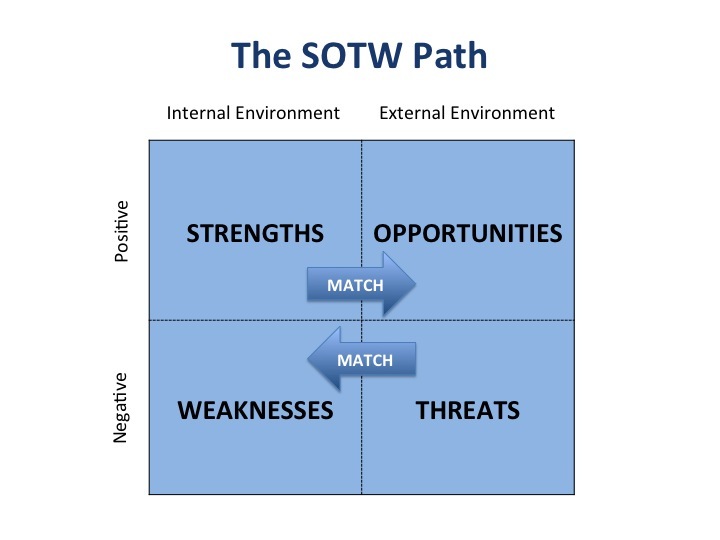 This is where you move in The SOTW Path from the T to the W. Just like matching Strengths to Opportunities, you need to see if there’s any match between Threats and Weaknesses. If there are none, move back to leveraging your Strengths in the greatest areas of Opportunity. If, however, there is a match between a Threat and a Weakness, that gap must be filled in some way or else you have a fatal flaw that will undermine your business, like a hole in the bottom of a bucket. For example, last summer I had a kidney stone attack while on a business trip in New Mexico. I received amazing treatment from everyone in the emergency room of the hospital I was rushed to. I did not receive a bill, however, for that treatment until six months later—180 days—an eternity in the world of accounts receivable. From the outside looking in, I would say this hospital has a strength, extraordinary patient care, in an expanding area of opportunity, the aging baby boomer population in a state that’s high on most lists of worthy retirement destinations. However, a threat to anyone in the health care industry is the ever-increasing demand for detailed documentation, including timely and accurate billing. If left unaddressed at this facility, it will become a fatal flaw. 1. You can stop doing it. 2. You can get a little better at it. 3. You can outsource it. A hospital can’t stop invoicing for services, but there are lines of business most companies could drop entirely. They’re not good at them and they aren’t profitable for them. Continuing to invest in these lines of business will result in even more loss, and they should be eliminated entirely. If you can’t eliminate something, it is possible to get a little better at a weakness. And that may be all that’s needed. An area of weakness will never become a strength, but it doesn’t have to be if good enough is good enough. Should you try to get a little better at something to fix a fatal flaw? It depends on the severity of the threat. A dire threat to your business cannot be met by getting a little bit better at something, a moderate threat might, however, might be assuaged in this way. Finally, the option I would recommend to my hospital friends, is outsourcing the activity to someone for whom this is a strength and represents a welcome opportunity. They will take it on with the passion and proficiency it needs, and the hospital will reap the reward of being able to focus on that which they do well and love to do. Speaking of friends, I would count Alan Weiss on that list, albeit a distant one. He is right, a SWOT Analysis used as a stand-alone strategy solution is overly simplistic. Those words could be said for any assessment that’s being employed as a magic bullet, as opposed utilizing a variety of tools in one’s consulting toolbox. I do think, however, that this assessment used in a more insightful way, as in SOTW, can bring helpful insight to the strategy formation process. I truly hope it won’t result in my being thrown out into the street!